Breaking out of the mindsets of traditional business models is one of the toughest challenges for any disrupted industry. And it’s one of the most important, because the old mindsets keep us from seeing new opportunities that are staring us in the face. In the newspaper and magazine industries, we definitely need new ways to see opportunities. At last May’s World Congress of the International News Media Association, James T. McQuivey of Forrester Research presented a good one: Adjacencies. We’re putting it to use in a practical process at Morris to help us identify new ways to engage and monetize audiences for our magazine and newspaper business units. You can do it, too. To see adjacencies, you need to start by putting your customer, or your intended customer, at the center of your thinking. In the traditional media — newspapers, magazines, books, television, radio — we’ve been serving that customer by providing certain types of information (or content) that meet their needs in certain ways. But the arrival of the infinite pipe with its many digital channels is disrupting those models, enabling our users/readers/viewers to get huge amounts of additional information/content in new ways from countless additional sources. New competitors are drawing away their attention, along with advertising and marketing dollars that used to be spent with us. To see new opportunities in this vast new space, McQuivey challenges us to draw a much bigger circle around these customers and look at their lives more closely. What other wants and needs do they have that are adjacent to the ones we already meet? Which of those could we fulfill — profitably — by using new solutions or technologies that are within the realm of the possible? This approach encourages us to take off the blinders of existing products and technologies, and examine the target customer’s situation instead. At Morris, we decided to apply this approach first in our magazine division. Frankly, it was easiest there because our magazines, like most, serve passionate enthusiasts. We serve horse enthusiasts with Western Horseman, Quarter Horse News, Barrel Horse News and Equine Journal, and we serve fly fishing and hunting enthusiasts with American Angler, Fly Tyer and Gray’s Sporting Journal. Most people have passions of one sort or another, and the digital revolution has given them many new ways to fulfill them. They can now access vast amounts of content related to their interests, and they can interact freely and often with other people who share them. For special-interest magazines, the good news is that the passions aren’t going away in the digital era. If anything, they’re getting stronger. The bad new is that a monthly magazine is now just one of many ways people can fulfill their passions, while many of the other ways are available every day, even 24/7. The challenge for magazines is to see beyond the limits of print and discover how the brand can expand into ways to engage and satisfy the user. With the Morris magazines, we brainstormed about these adjacencies for each title in day-long sessions that included editorial, sales, marketing and circulation people. Now there’s work under way to determine which of the new ideas we identified are most practical and how we can move to fulfill them. In each session, we put a specific enthusiast in the center — the fly fisherman, the Western horseman, the barrel-racer, etc. Because each magazine’s staff members are mostly enthusiasts themselves, the the ideas came pouring out. The exercise consisted of two parts. First, we brainstormed about the activities, problems, wants and needs that this group of enthusiasts have in common. (Clayton Christensen and the Newspaper Next project called these “jobs to be done.”) This usually took less than an hour. For each group, it yielded a unique set of opportunity spaces surrounding the user. Even among the four horse magazines, which had much in common, there were important differences because each horse discipline has its own special attributes. Second, we focused on a few of these circles and brainstormed about ways we could meet an urgent need for the user. Here, it’s critical to choose circles that involve a large number of users, are currently underserved in some way, and have significant revenue potential. Otherwise, the opportunity may not be big enough to be worth pursuing. 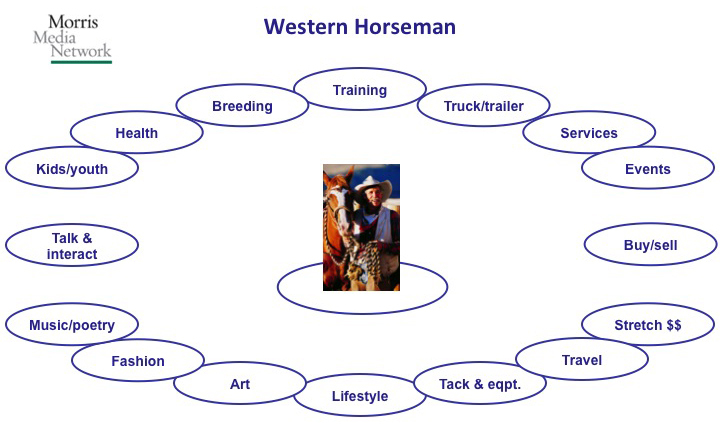 In the Western Horseman session, some of the most interesting circles were training, events and travel (which might be combined in some ways) and the lifestyle-related group that includes tack and equipment, art, fashion and music/poetry, all of which might lend themselves to e-commerce solutions. For each of these, and for several other circles, too, the group then brainstormed for more than an hour on specific solutions that would engage and excite their target audience — and make money. The process was the same for each of our titles, and in each case, some very attractive possibilities took shape. All the titles are now doing further research and development work on these ideas. What about newspapers? This is a different ballgame, because our audiences have no single passion in common. They have plenty of passions, of course, but the main thing they have in common is that they all live in the same community. And for most of them, our main product — news — is not really a passion. It’s more like breakfast: something they want a little of before they go on to the things that matter in their lives. And those other things, usually, are where their passions lie. But people in a community do have much in common, and they are passionate about many of those things. They work there, eat there, shop there, raise families there, recreate there, find ways to entertain themselves there, and so on. Usually, they feel some pretty strong passions about the lives they lead in our communities. Can we tap these passions by meeting new needs for our users? Absolutely — but we have to start by stepping outside the narrow realm of news and looking at their world through their eyes. The adjacencies exercise is a good way to get started. This week, the VPs of audience from the Morris newspapers were in Augusta for a Morris Audience Summit. We held an adjacencies brainstorming session, and it produced some very interesting results. We’ll be digging into the possibilities. Posted on March 26, 2013, in Audience, Disruption, e-commerce, Magazines, Media business model, Revenue, Uncategorized and tagged adjacencies, audiences, disruption, innovation, magazines, media, newspapers, passions. Bookmark the permalink. 1 Comment.